In The Flavours of Love, Saffron Mackleroy spends a lot of time trying to find out which foods can be combined together so they make up the flavours of love. It’s the only way she can start to move on after her husband’s murder and to handle the new devastation that has arrived in her life. 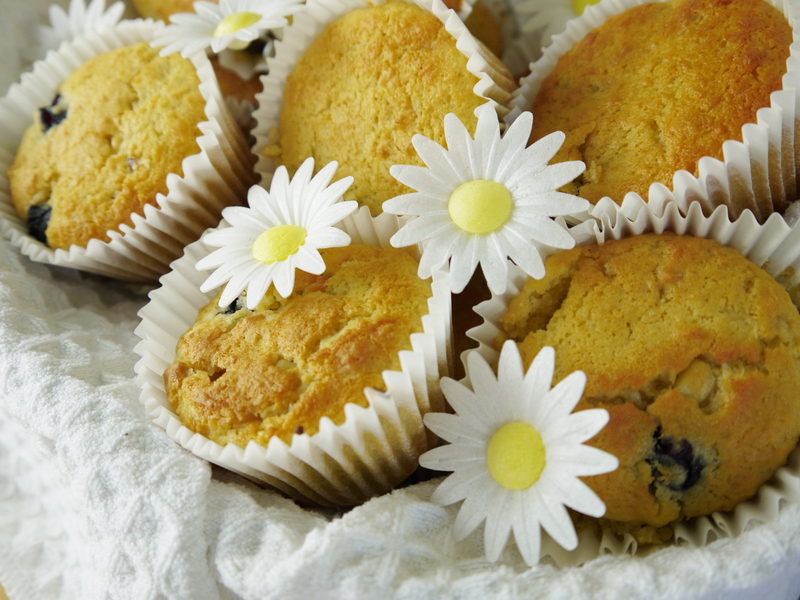 One of the first recipes she successfully tries is this one – Blueberry, Coconut & White Chocolate Chip Muffins. I was as surprised as Saffron is by how well the flavours work together! Preheat your oven to 200c/Fan 180c /Gas mark 6. Heat a dry frying pan (non-stick is best) and then toast the desiccated coconut until it is very slightly browned. Remove from the heat and set to one side. Grease a 12-hole large muffin tin or line with paper muffin cases. Weigh and sieve together into a large bowl the flour, baking powder, sugar and salt. Stir in the cooled toasted coconut and then stir in the white chocolate chips. In the frying pan you toasted the coconut – melt the butter. Remove from heat and set aside to cool slightly. Beat the egg in a separate bowl then add the milk and melted butter and mix together. Add this mixture to the dry ingredients. This will go against the grain, but mix lightly until combined. Wash the blueberries and then pat dry with a clean paper towel. In a bowl, coat them with the 1 tablespoon of plain flour. Gently fold them into the batter – being careful not to over-mix. Spoon the batter into the muffin cups/paper cases. Bake for 12 to 17 minutes. When a wooden skewer inserted into the middle comes out clean, they’re cooked. Leave the muffins to cool for about 10 minutes before turning them out onto a wire tray or removing from the tray if using paper cases. Store in an air-tight container for up to 2 days. Be careful not to overdo it when toasting the desiccated coconut or the coconut will be tough in the muffins. When greasing the muffin tin, I find it easiest to cut a piece of cold (from the fridge) butter and smear over the cups. When mixing the wet ingredients into the dry ones, try not to stir too much. I have a real need to completely mix things in, but that always ends up with tough, rock-like muffins. Coating the blueberries in flour stops them from sinking to the bottom of the muffins. Although they’re very moreish, these muffins are pretty rich and decadent, so don’t overdo them!